This tour offers visits to two quite different highlights located within a short distance of one another: a breath-taking dawn at a geothermal wonder in the immensity of the desert and a glimpse into the simple life of a shepherd in a small remote farming settlement. Depart early (usually approx. 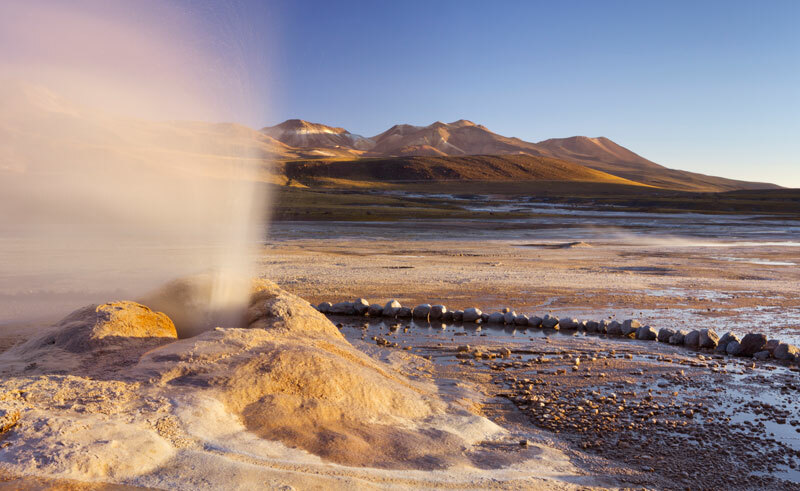 5am) to the El Tatio Geysers geothermal field, located at an altitude of over 4,300 meters. This volatile world offers an amazing spectacle at dawn: steaming fumaroles and spouting geysers that can reach up to 6 meters high. The experience is complemented with guided walks past hot craters of mud and small bubbling pools. On the way back, pause in Machuca, a picturesque village located at an altitude of 4,000 meters. With some twenty homes and a church, you will be given an introduction to the way of life for the llama shepherds that inhabit it. The area is home to a variety of local fauna, such as llamas, alpacas, ducks, Andean seagulls and flamingos. Notes: Subject to climatic conditions and not recommended for people with health problems due to the high altitude. A light breakfast is included. Standard excursion prices are per person, but require a minimum of 2 total passengers. The standard version also includes entrance to ‘Pozon Rustico’, a nearby geothermal bathing pool.